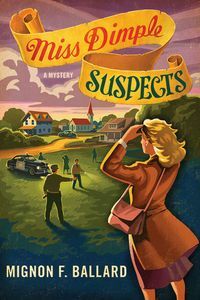 Miss Dimple Suspects by Mignon F. Ballard: Synopsis and Online Purchase Options. Synopsis (from the publisher): With the country in the midst of World War II, you can be sure the small town of Elderberry, Georgia, will pull together to find a missing child. And you can be equally certain that first-grade teacher, Miss Dimple Kilpatrick, will be in the search party — especially since Peggy Ashcroft is one of her students. Miss Dimple carves out a search path all her own and once again, the sharp-as-a-tack teacher is right on point. But she finds Peggy too sick to walk and it's too dark for Miss Dimple to find her way back. Luckily, she comes upon the home of an elderly artist, Mae Martha, and her young companion, Suzy, who helps ensure that Peggy returns home safe and sound. A few days later, however, Miss Dimple receives a frantic call from Suzy: Mae Martha has been murdered and Suzy is seen as the most likely suspect, because her family is Japanese. Miss Dimple and her fellow teachers Annie and Charlie don't buy it; and set out to prove Suzy's innocence, only to discover danger where they least expect it.